The Amphitrite Lighthouse is a classic sight in Ucluelet. In fact, if you’ve been to Ucluelet, but didn’t go to the lighthouse, it hardly counts as having visited the quaint fishing village on the west coast of Vancouver Island. As peaceful and postcard-perfect as the lighthouse looks, especially as the sun kisses the horizon goodnight, basking the squat white building in pinks and golds, it is a product of tragedy. While we all know of the dangers the wild winter storms of the west coast can bring, back in 1905 they did not. Amphitrite Point has an endpoint marked by a dangerous reef where two weeks prior to the tragedy that broke the proverbial camel’s back, an incredible storm had caused the disappearance of the whistling buoy that marked it. As the storms continued, it was not the last artifact of the ocean to disappear below the wild waves. It was Christmas Day in 1905 when the fated ship, the Pass of Melfort, did not arrive at its scheduled port. Post-tragedy, the shipping industry began to push for a light at the perilous point. By January 1905 and for a one-hundred and forty-dollar price tag, a small tower with a thirty-one-day lamp was erected on the coast. For eight years, the original wooden tower graced the rocks, withstanding some of Mother Nature’s greatest tempests until a wild wave brought it down to the ocean’s floor. Almost immediately, a new lighthouse, station and fog alarm were requested to be placed at Amphitrite Point and so, the current cement-crafted lighthouse was born. Looking at it today, it is hard to believe that someone once lived inside, but it’s true! The Amphitrite Lighthouse had its own onsite keeper until 1928, when the latest resigned and declared the space unfit for living in. A small construction was then built, complete with a phone line to Tofino. By 1988, the lighthouse no longer required a keeper at all, having been automated, and the tower was closed off to visitors. Today, the Amphitrite Loop of the Wild Pacific Trail is one of the top things to do in Ucluelet, as it offers incredible views, and classic nautical scenes. Accompanied by the mournful wail of the fog horn, strolling the coastline of Ucluelet is a true, west coast experience. Of course, the coast still gets those incredible storms that caused so much tragedy and required the appearance of the lighthouse. 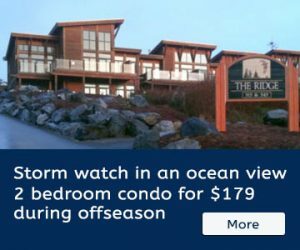 This brings us to another of Ucluelet’s top things to do – Winter storm watching. Staying back from the rocks, a growing number of visitors don their toughest rain gear, and get outside in the torrent to watch as incredible waves of up to fifty feet rise and crash against the rugged coastline. Aside from the Amphitrite Lighthouse Loop, other popular places to storm watch include the rest of the 8km of the Wild Pacific Trail, and the Ucluelet Blowhole. No matter the season, seeing the Amphitrite Lighthouse is a treat for the eyes of anyone on the coast. Amphitrite, by the way, was the name of Poseidon’s sea-goddess wife after whom a number of British Royal Navy ships have been named. One of those ships became the scenic Vancouver Island point’s namesake. Whether you’re in Ucluelet because you couldn’t find accommodation in Tofino, planned on fishing, or wanted to enjoy some surfing, a walk around the Lighthouse Loop and to see the lifesaving, historical building itself is a must. Pacific Rim Whale Festival 2018 An Ideal Day in Ucluelet B.C.